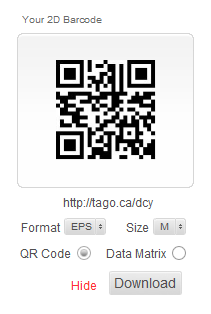 Welcome to TAGO, QR Code Management and Tracking System. With our system you can easy create a barcode and know who, when and where has it scanned. Also TAGO also gives flexibility to QR codes, by allowing the marketer to change its function or destination at any time, allowing new information or features to be offered to the users without the necessity for reprinting or changing the codes, themselves. • Social media – Allows the user to “like”, tweet, or share. The QR code was a kind of two dimensional symbology, and the DENSO WAVE (established under the name of DENSO) developed with a main objective of "Code read easily for the reader" in 1994. The QR code is that carry meaningful information in the vertical direction as well as the horizontal, hence the two-dimensional term. By carrying information in both directions, QR code can carry up to several hundred times the amount of data carried by an ordinary bar codes. Take full advantage of many other powerful features.